A casual look at the night sky gives the impression that stars do not move relatively to one another. In reality, however, all of them move around with high speed in our Galaxy. It is only because of their large distances that this movement is difficult to notice. You therefore need a highly accurate instrument to measure that movement. The Gaia satellite repeatedly measures the position of an enormous number of stars, and it does so with a very high accuracy. By seeing how this position changes over the months and years, Gaia can measure how fast each star moves across the sky. But that still does not tell us if the star is also moving in our direction, or away from us. To measure this, Gaia has an instrument on board, called the Radial Velocity Spectrometer (RVS). Instead of just making an image of the star (as on the left part of this figure), the RVS takes a spectrum (as on the right part of the figure). The light from each star is split into its different colours. Actually, only a small part of the full wavelength range is observed by the RVS: from 846 to 870 nm. Using the spectrum of a star, we can determine the component of the movement in our direction. The principle behind this technique is called the Doppler effect. A star moving away from us will have its light slightly shifted towards the red, while a star moving towards us will have its light slightly shifted towards the blue. Using the RVS, we can determine this shift and thus measure the movement of the star in our direction. Each spectrum shows a number of spectral lines; these are wavelengths where less light is coming through because it gets absorbed by some atom or ion. 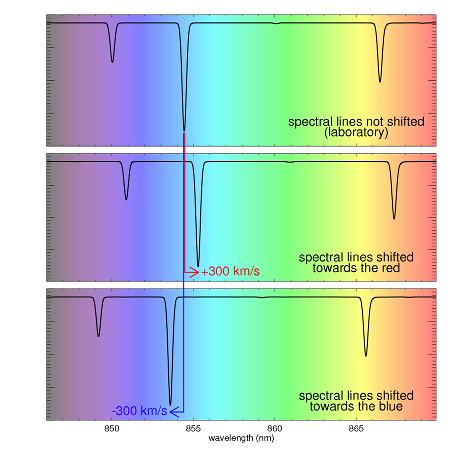 The laboratory wavelengths of these spectral lines are known (top panel). 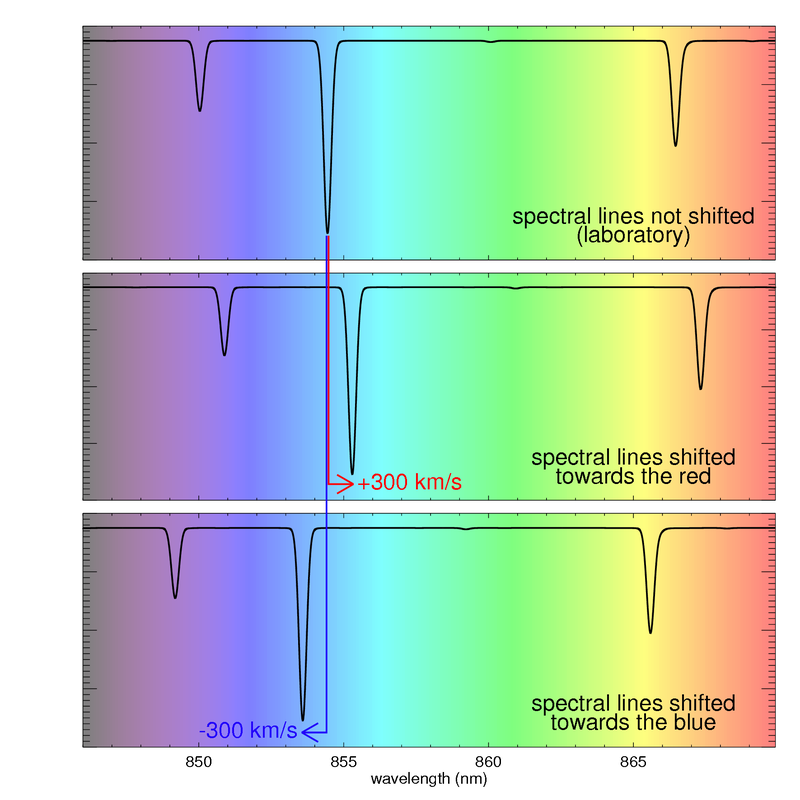 But when we look at a star, these spectral lines can be at a different wavelength than the laboratory ones. This is due to the Doppler effect. The lines can be shifted to the red, showing that the star is moving away from us (middle panel). Or, they can be shifted to the blue, when the star is moving towards us. By combining the information from the movement across the sky and the movement in our direction, we know how each star moves around in our Galaxy. This information will ultimately lead to a better understanding of the structure and formation history of our Galaxy. At the Royal Observatory of Belgium, Ronny Blomme, Yves Frémat and Alex Lobel contribute to the software that converts the raw data from the RVS into the measured movement of the star. At the Belgian level, there are also contributions from the Universiteit van Antwerpen and the Université de Liège. The group of people responsible for the analysis of the RVS is called Coordination Unit 6. Besides the three Belgian institutes, there are another 18 (mostly European) institutes contributing to this. Coordination Unit 6, in turn, is part of the larger Data Processing and Analysis Consortium (DPAC) that is responsible for the analysis of all data from the Gaia satellite.